A big issue that I found after my injury, was that I did not enjoy “swimming” as much. I don’t love trying to do a lot of lengths in a pool, but I do very well either walking in the water or snorkeling. I use a mask and snorkel and small light swimming fins to allow myself to float without straining my body and to also get gentle motion and exercise. Relieving pain in a pool is all about gentle motion. It’s not about how many laps you can swim, it’s about gently moving your body in 3-D space and allowing it to go through complex ranges of motion. Motion that you may never get on land. Moving my arms and legs in this way, I slowly work out the kinks in my muscles and I often experience a significant amount of pain relief. 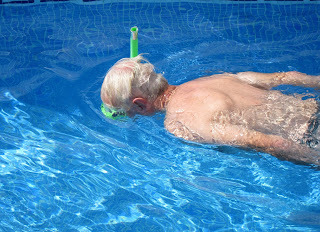 I got the idea for using a snorkel in the pool from scuba diving. Taking the same principles and putting them to work in a swimming pool is how I figured out to use a snorkel in a regular pool. Not only do I use a snorkel, but I also use a thin wetsuit to keep me warm in the pool. I find that if my body is cold that my muscles will get tight and it can undermine the whole point of being in the water. With a wetsuit, it solves my problem. I can stay comfortable and warm and get lots of gentle motion without straining myself by trying to swim laps in order to stay warm. I also wear a neoprene hood when I snorkel in the pool. While I look ridiculous, I have found that a hood is the most important thing to keep me warm and comfortable. Even a thin ½ mm wetsuit vest in combination with a neoprene hood is comfortable for me (as compared to even a 3mm wetsuit without a hood). I also find that a hood helps with keeping my head more buoyant in the water allowing my neck to stay in a more neutral position. A wetsuit and hood help to keep my spine in a much more neutral position than trying to swim without. This is important if you have any kind of spine or joint pain. One option for water therapy is called a float tank. You float in a pod like device that is filled with water that has a tremendous amount of Epsom Salts mixed in. This allows you to actually float on your back comfortably in a relatively neutral position. I like to float and do gentle stretching. I find that the Epsom Salt (Magnesium Sulfate) relaxes my muscles and allows me to do stretching that I might find painful on land. It’s also an interesting experience being in the dark and floating. It is very relaxing, and I also find it easy to meditate because I am so comfortable. The only problem is that most float tanks use chlorine. There is at least one company that does not use chlorine called Float Lab. If you find that chlorine bothers you then look to see if there is a float tank that does not use chlorine or other toxic chemicals in your area. I find exposure to too much chlorine actually can cause me discomfort. I try to avoid getting in a traditional swimming pool more than a few times a week and I especially limit my time in hot tubs. Hot tubs not only have a tremendous amount of chlorine, but the chlorine is also absorbed more efficiently into your body with the warm water. Whenever I swim in a chlorinated pool, I use detox products to help get rid of the chlorine efficiently from my body. I use both homeopathy and extra nutrients that promote detoxification. Of course, I much prefer snorkeling or scuba diving in the ocean, but I don’t get to do that as often as I might like because the ocean close to me is really cold. Nevertheless, I hope that the knowledge that I have gained from snorkel and scuba diving might benefit you and offer you some relief from any pain you might experience. You should be able to find a local supplier of scuba equipment if you live in a relatively large city. Otherwise, you can go online to find scuba suppliers. Make sure to purchase from a supplier who will allow you to return your purchase. Wetsuits are especially challenging to fit correctly and so you may need to try a few before you find what works. Wetsuits can also be purchased at surfing/ water sports stores. You want a suit called a shorty. It has short arms and short legs. You don’t want a tri-athlete suit. That does not have coverage over your arms and so your shoulders might get cold unless you swim hard like a tri-athlete. It’s important to get a thin wetsuit, 2-3 mm or less. The wetsuit needs to be made of super stretch neoprene that flexes with your motion. Recently, I had a custom wetsuit made with 2mm super-stretch neoprene. It has short arms and legs and allows me to move comfortably in the pool. Not everyone needs a custom suit, but I have found this 2 mm suit to be the perfect thickness for pool swimming. You can buy 3 mm shorty wetsuits easily online or at a scuba/water sports store, but it is hard to find 2mm suits, which is the reason I had one custom made for me. However, if you don’t have access or the resources to get a custom suit then a 3mm shorty works great. It’s just a little more buoyant but then it’s warmer too so you need to do less exercise to stay warm! You want to purchase a scuba mask and a simple snorkel. You want the lightest snorkel available and so don’t purchase an expensive snorkel with all kinds of features. The simplest snorkel is best. Also, you want to get fins that are specifically made for swimming. I have found that scuba fins simply don’t work in a pool. They are too long and cumbersome. You want the lightest and most buoyant type of swimming fins instead. In terms of a neoprene hood, that can be difficult if you have a bad neck. Most neoprene hoods need to be pulled over your head and, even if they have a zipper, they are a tight fit. I finally had a custom hood made for me that has a zipper on the side and allows my head to easily get into the hood without any discomfort. Not everyone needs a hood but if you really want to stay warm then that is the way to go. They are easily obtained from a scuba store but be warned that you may need to modify the hood by having them add a long zipper to allow your head to get through easily. Not all scuba stores can do these types of modifications, so check before you purchase. Custom wetsuits and hoods are available from several companies. They usually ask for your measurements and then send a suit and/or a hood to you. A better option is to see if there is anyone in your community who makes custom wetsuits. They can measure you directly and then tailor the suit to ensure the best fit. Unfortunately, it is a very specialized skill to custom make a wetsuit and so you may have to settle for a wetsuit by mail, if you really need a custom suit at all. Fortunately, there are many great wetsuits on the market to choose from and so a custom suit is generally not necessary. Professional Formulas makes a “pool and spa” formulation. They also make a “simple chlorinated compounds” formulation. I use a few drops of these formulations before and after swimming. I use a product from Thorne Research called Basic Detox Nutrients to help my body detoxify the chlorine.